Biography of German Expressionist Painter, Kandinsky's Lover. Meditation (1917) By Gabriele Munter. 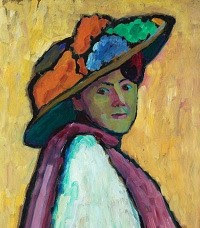 A well known contributor to German Expressionism, Gabriele Munter came to Munich in 1901 to study art, and in 1902 became a pupil of the great Russian artist Wassily Kandinsky (1866-1944). In 1903 they became lovers and for the next thirteen years were inseparable. During the summer of 1908, which she spent in Murnau with Kandinsky, along with Alexei von Jawlensky (1864-1941) and his Russian lover Marianne Werefkin (1870-1938), she finally found her individual style - a form of expressionism combining Bavarian folk art, stained glass work, and luminous blocks of colour. She was also influenced by Van Gogh and by Jawlensky himself: not for nothing was he known as the "Russian Matisse". The result of all this was a vivid brand of landscape painting, figurative works and still life painting in which melancholy and dream merge. In 1909 she was co-founder of the New Artists' Association in Munich, a member of the German Expressionist group Der Blaue Reiter, and a participant in all major shows of avant-garde art (including the two Blaue Reiter exhibitions) in Germany until 1914. In that year Kandinsky had to leave Germany. Munter met him once more in Stockholm before they finally parted in 1916. After the war she settled in Murnau where she lived a secluded life. For more about Munter's contribution to the evolution of expressionism, see: History of Expressionist Painting (c.1880-1930). Born in Berlin, Gabriele Munter trained at the Ladies Art School (Damen-Kunstschule) in Dusseldorf, before touring America for two years with her sister, visiting relatives in Arkansas, Missouri, and Texas. By 1901 she had returned to Germany where she resumed her art studies in Munich. Because the Munich Academy of Fine Art did not enrol women, she attended the private school 'Phalanx', run by Wassily Kandinsky. In 1904, Kandinsky separated from his wife, whereupon he and Munter began cohabiting - an extremely daring action for a young woman of the time. In 1905, the 39-year old Kandinsky painted Munter's portrait - his one single attempt at portrait art. During the period 1904-1908 the pair travelled extensively throughout Europe and North Africa, spending more than a year in France, where they met artists like Henri Rousseau (1844-1910), Henri Matisse (1869-1954) and other members of the Ecole de Paris. In 1908 they settled in an apartment in Munich. In 1909 Munter bought a country house in Murnau, in the Bavarian countryside, where they spent most of the summer months; it was also intended as the couple's retirement home. Their regular circle at this time included modern artists like Jawlensky, Franz Marc (1880-1916), Paul Klee (1879-1940) and Auguste Macke (1887-1914). Munter would outlive them all by 40 years. In 1909, along with Kandinsky, Munter became a founder member of the New Artists' Association of Munich (Neue Kunstlervereinigung Munchen), an early organization within the expressionist movement which was set up to provide a more liberal alternative to the Munich Sezession, but in 1911 she quit the group to join Kandinsky and Franz Marc in their new group Der Blaue Reiter (The Blue Rider). The group's core members were Kandinsky, Marc, Jawlensky, Klee and Macke. It was the second group of German expressionist painters to be established: the first was Die Brucke (The Bridge), based in Dresden then Berlin, whose leading members included Fritz Bleyl (1880-1966), Ernst Ludwig Kirchner (1880-1938), Erich Heckel (1883-1970) and Karl Schmidt-Rottluff (1884-1976). Another artist associated with both groups was Emil Nolde (1867-1956), founder of the revolutionary Neue Sezession. Although Munter deferred inevitably to her older and more creative partner, right from the beginning she had her own style of painting, which may have influenced Kandinsky's own vision - and may even have become an issue between them. For instance, while she was interested in Kandinsky's passion for abstract art, her own 20th-century paintings remained firmly figurative. Originally a follower of Impressionism, Munter then turned to Fauvism (1905-6) before settling on full-blown expressionism, under the influence of Jawlensky and the works of Van Gogh (1853-90). In 1909, at Murnau, she began painting glass, an activity later adopted by her partner as well as other Blaue Reiter members, which helped her to discover her true style - a form of luminous expressionist painting with stained glass-style outlines. One might say it resembles a cross between the angularity of Schmidt-Rottluff, the luminosity of Georges Rouault and the dark edging of cloisonnism. The mixture of folk art and modernist forms is vaguely reminiscent of the Russian female expressionist Natalia Goncharova (1881-1962). Unable to paint, Munter travelled extensively. From Stockholm she went to Copenhagen, after which she returned to Germany, spending time in Munich, Murnau, Berlin and Cologne. In 1927 she met the German art historian Johannes Eichner, who became her lifelong companion. The two settled in Murnau, where Munter lived and worked until her death. Despite the Nazi ban on modern art and the closure of her 1937 exhibition at the Munich Art Association (Kunstverein Munchner) because of her "Degenerate Art" (entartete kunst), she continued to produce a variety of work, including portraiture, genre paintings and still lifes. In 1956 she was awarded the Culture Prize in Painting by the city of Munich. In 1957, on the occasion of her 80th birthday, she donated an outstanding collection of almost 200 paintings (120 by Kandinsky, 60 by herself) to the city of Munich. In the same year, the Stadtische Galerie im Lenbachhaus in Munich held a major retrospective of her painting. In 1960 she had her first solo art show in the United States, and in 1961 she had an important show at the Mannheim Kunsthalle. She died in her house at Murnau on 19 May 1962. Paintings by Gabriele Munter can be seen in some of the best art museums in the world, notably the Lenbachhaus Gallery in Munich.  For biographies of other modern German artists, see: 20th Century Painters.  For more details of German Expressionism in Munich, dresden and Berlin, see: Homepage.